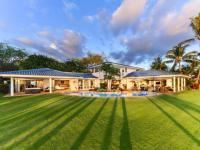 Black lava ledges, many beaches, views of Molokini and ranch lands comprise this town on south Maui. Our Makena vacation rentals are only minutes from Wailea, so you'll enjoy the best of the area's golf, shops and restaurants. Makena is exemplified by beaches, particularly Big Beach, its other name. Big Beach is two beaches, simply Big Beach and Little Beach, which are parted by an earthquake and lava flow in 1790. The stretch between the two areas is known as Earthquake Hill or Pu'u Ola'i. Makena area beaches offer enough to do for several days so you might want to plan your itineraries for early morning and sunset strolls, snorkeling, kayaking swimming, picnicking and sunning. Wailea and Keawakapu Beaches are notable for walking. Among the sea life in the gorgeous blue-green waters are turtles, dolphins and whales. 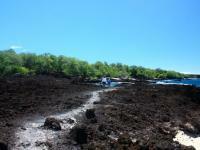 Find even more marine life at Ahihi-Kinau Natural Area Reserve, amidst its lava rock and coral reef. Keep in mind that while the and Kalua o Lapa, Kalaeloa (Aquarium), and Mokuha (Fishbowl) are closed, the northern access is open to visitors, including Waiala or Kanahena Cove and the coastal area along 'Ahihi Bay near the "Dumps" surf break (the restricted areas will remain closed until mid-year 2012 and always verify information before visiting). Golfing is spectacular in Makena and its resort neighbor, Wailea. The Makena Beach & Golf Resort is on a site that ancient Hawaii formed to perfection and that remains so today, with accents of fishponds, heiau and dormant volcano Mount Haleakala. Try to keep focus as both Molokini and Lanai views are in the distance. The legend of the area is that the volcano goddess Pele's volatility caused a star to shatter and become a flower on the spot on which Makena now sits. Burgers, barbecue and sushi are only a few of the types of food available in Makena and nearby Wailea and Kihei. Grocery stores and small markets are located in the area as well as upscale seaside dining in Wailea's resort area. The south Maui area's farmers' market is in Kihei, less than 10 miles away. The market includes the island's products (make sure to enjoy some Maui onions), including pineapple, macadamia nuts, baked goods and tropical juices. Beyond the general stores and local shops, Makena is located in an area near art galleries and gear shops, including sports gear rentals. The Piilani Village Shopping Center in Kihei is a convenient place to go for basic goods and services. Wailea's resort shops are also a place for serious shoppers looking for gifts, apparel and jewelry. Makena is a small residential area just a few miles south of Wailea. 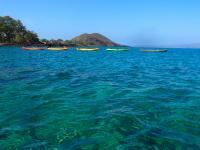 Makena Beach, which is also known as Big Beach is one of the best beaches on Maui. With thick soft sand, swaying palm trees everywhere and crystal blue waters, this is definitely a sight to see. The beach is ideal for a day out with the whole family with calm swimmable waters. Just down from the beach is Makena Bay where ships used to import and export goods from the outer islands. There are also a number of historical sites in Makena that is sure to intrigue you.